Wolfenstein: The Old Blood is very much an expansion of its fun, entertaining predecessor, but doesn't quite pack the same emotional clout. Still, a great FPS worthy of your attention. MachineGames managed to pull off a pretty impressive feat with last year’s Wolfenstein: The New Order, dragging the Wolfenstein name back to relevance with its combination of meaty, old-school shooting, a surprisingly touching storyline, rich characterisation. The Old Blood is a ‘standalone expansion’ - meaning you don’t need the original game at all - set before the events of The New Order. You don’t need to have played the first game at all to get a load out of this. In fact, this might convince you to go back and pick it up. Action is the order of the day in The Old Blood. At its core it is a big dumb shooter, fast-paced and with a really satisfying feel to the weapons - that crunch of the shotgun, or the subtle upwards pull of the assault rifle, that makes it feel like you’re really wrestling against the recoil - something that games bearing the iD Software name have always had. There’s more going on alongside the action though. There are ‘soft-stealth’ sections, huge rooms filled with Nazi soldiers and a couple of Commanders who, if taken out silently without alerting anything else in the room, will prevent reinforcements being called and give you an opportunity to take out the rest of the room without quite so much fear of the doors. It is a neat little system - a bit of risk/reward tempered by the fact that if you do decide to ‘go loud’ and shoot everyone in sight, you’ll have plenty of targets. The alternative history setting of The New Order gave MachineGames carte blanche to create some really interesting and unique levels, with B.J. Blazkovicz (that's you) being sent on a globetrotting (and beyond!) mission to save the world. Here things are dialed back to play out over a much smaller but still wonderfully designed area. The cable car to the castle - which looks like it is built into the vast mountainside - overlooking the village you will travel to later, is a spectacular opener. In the first chapter, B.J. finds himself holed up inside the prison block of Castle Wolfenstein itself, at the mercy of dog-obsessed Nazi soldier Rudi Jager, stripped to the waist and equipped with only a salvaged pipe. This pipe not only acts as a weapon, but also a means to open doors and, in a new mechanic, climb certain vertical surfaces. That immediately comes in handy as you’re tasked with escaping the castle, having learned the location of big bad Deathshead’s fortress, setting up the events of The New Order. Cutting about the castle feels like a real nod to the old Return To Castle Wolfenstein. In The New Order, allowing BJ to sleep while in the rebel base unlocked a nightmare sequence set inside a level from the original Wolfenstein 3D. This time, there’s a bed hidden in every level, one for each level from the first chapter of Wolf 3D, including showdown with the boss Hans Grosse. Sadly, no Mecha Hitler. Chapter two, however, is where things get really wild. 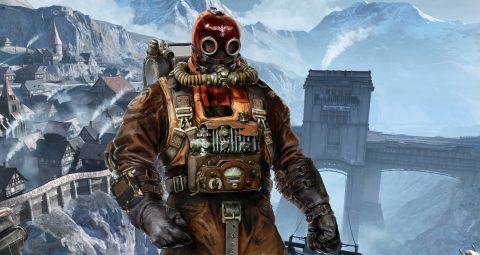 A jaunt through a quaint Bavarian mountain village goes resolutely south when The Old Blood revisits some of the supernatural elements from the Wolfenstein series. “Not more Nazi zombies”, I hear you cry, but show some respect - these are THE Nazi zombies. An accident at an excavation site quite literally unleashes hell across the village, turning it into a burning shooting range packed with shambling undead. It’s a nice change of pace from the usual Wolfenstein steeze, with opportunities for some interesting tactics in causing in-fighting between the living and dead SS soldiers. It isn’t all killing, believe it or not. There’s an awful forced stealth section right at the beginning, where you have to sneak past killer mechanised super soldiers to disable their power supply. If they spot you, you can flee, but their miniguns rip you to shreds in seconds, so it may as well be insta-death. Mercifully, this segment is short and the game doesn’t try anything else like it throughout its duration. In fact, by the time that these super soldiers show up again, you’ve got a full arsenal of weaponry and subsequently more than one way of dealing with them. Both the strongest and weakest aspect of The Old Blood is its brevity. You can smash your way through the campaign in four to six hours and the only misstep is that aforementioned stealth segment. The firefights quickly ramp up in intensity to match those found towards the end of the original game, and there’s always some new area, weapon or enemy to deal with, keeping things interesting for the duration. It is a far more focused and to-the-point game, at least when it comes to the actual shooting of things. Sadly, the characterisation has been given very much a back seat. There are some excellent moments, such as Helga Von Schabbs' tragic backstory, but most lack real emotional weight. In The New Order, characters have time to blossom into real ‘people’, whereas The Old Blood is in a rush to get you to care about their motivations and history. Obviously, that doesn’t detract one bit from how much fun all of the killing is, but by comparison the original game has something really quite special going on in the quality of its writing. Its characters frequent pass both the Bechdel and Plinkett tests (ie. you can satisfactorily describe a character without mentioning their job or appearance), something very few video games achieve. It is a bit of a shame for that quality to be here. Wolfenstein: The Old Blood is another sterling effort from MachineGames, fast proving to be real players in the FPS genre. This add-on clearly has smaller scope than was found in The New Order, keeping things much more 'down to Earth', but the core shooting experience that makes the reborn Wolfenstein such a pleasure to play remains perfectly intact. If you like shooting zombies and Nazis with extravagantly powerful weapons (and lets be honest here, who doesn’t?) this is well worth checking out. Description BJ Blazkovicz returns (again) in a standalone prequel to 2014's barnstorming Wolfenstein: The New Order.